My schedule is quickly filling up for the rest of the year and I get stressed out even looking at it. 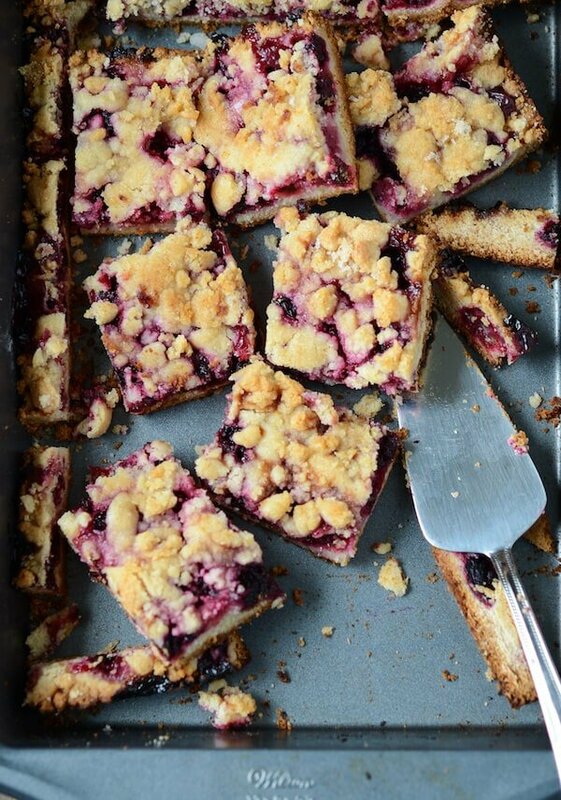 So instead of dealing with it, I decided to make these Blackberry Pie Bars. Between Jorge and I, we have over 12 trips before the end of the year. Some are work related and a bunch are personal, but it makes our calendars look pretty crazy. Today we sat down to go through and fill our joint calendar out and it was really overwhelming to look at. Before the end of the year, we will be heading to NYC, Texas (more than once probably), Blue Ridge Mountains, Boston and South Florida to visit friends (and again to visit my baby sister at college). And that’s only our joint travel! Airlines really need to start offering stock options once you fly them as much as we do. We are kicking this all off with a warm up weekend to Orlando. Some of Jorge’s family is in Orlando for the week and we are heading over for a quick over night stay to visit and catch up. Thankfully Orlando is only a little over an hour away, but that doesn’t mean we don’t need a road trip snack! 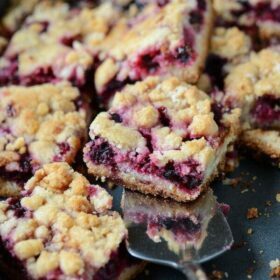 I quickly whipped up these Blackberry Pie Bars and they are just as good they look. I love that you get the taste of pie with these bars, but don’t actually have to roll out pie dough. It’s a miracle! At least it is to me — the girl who unreasonably hates to deal with rolling out perfect even pie dough. If you love this recipe, you will also love this Skillet Berry Cobbler that requires no pie crust and combines Raspberries and Blackberries! I love the burst of berries combined with all the delicious buttery crust surrounding them. I used blackberries, but raspberries, strawberries and blueberries would all work great too. Or go crazy and make them with multiple types of berries! Preheat the oven to 375°F. Grease a 9×13 inch pan. In a food processor, pulse together flour, 1 cup of sugar, baking powder, cinnamon salt and lemon zest. Add the butter, egg and vanilla extra. Pulsing until dough is crumbly. Pat half of dough into the bottom of the prepared pan, saving the remaining dough for the topping. In a medium bowl, stir together the remaining 1/2 cup sugar, cornstarch and lemon juice. Gently mix in the blackberries. Sprinkle the blackberry mixture evenly over the crust. Crumble remaining dough over the berry layer. Bake in preheated oven for about 45 minutes, or until top is slightly brown (you are only looking for the top to slightly brown, if you cook for too long – the bottom will burn). Cool completely before cutting into squares. Store in an airtight container. Making pie crust look pretty is my enemy so this recipe is right up my ally! Made these today with blueberries and rasberries, the turned put great. Cut in squares for school and work lunches. MMM good. Its a keeper. Oh my, you DO have a jam packed rest of summer! Good luck with the rest of it. Sweets sure help when I’m feeling stressed…like these bars! Yum! Boston?! Yay! Sorry totally distracted by that. Okay these bars… helloooo! Love your styling and I bet they tasted beyond delicious. Whoa! You are busy! Sounds fun though! These bars looks awesome. I love blackberries!! I love baking with fruit and have a cake next week that uses blackberries. I love love these bars! And glad they’re bars rather than a pie – faster and less fussy 🙂 Pinned. These are absolutely stunning…and calling my name! I’m so down with anything that tastes like pie but doesn’t require making the dough. I love blackberries, too, so I’m sold! My mouth literally started watering when I saw that first picture. Gorgeous pictures!! These look amazingly delicious! Perfect timing! My blackberries just ripened a crop large enough for this. Time to go out and pick! Blackberries are one of my favorite fruits and it’s hard to find good recipes using them. These looks so great! Love the photos. Great perspective! I NEEEEED these in my life!!! I totally need these bars in my life!! That is a LOT of traveling! I’m exhausted just thinking about it! In fact, I think I”ll need a few of these bars to sustain myself! I tried these this afternoon. They were easy to make and got rave reviews all around. Do you think frozen blackberries would work? I think you could use frozen berries if you made completely positive there was no extra water/frozen ice stuck to them. Would hate for the bars to turn out soup-y! Would you recommend defrosting frozen berries completely? Would I want to drain them and omit the liquid? I made these today. The perfect dessert! Thank you! I freakin’ love pie bars, almost more than pie itself! Gimme one of these and an espresso now.. These look heavenly! All that fresh fruit bursting through is just gorgeous. 🙂 And I kinda think that when you can make pie bars that are just as good as pie, why go through the pie-making hassle? I’ve made a version of this same recipe (via Smitten Kitchen, who cited All Recipes). MAN, SO GOOD. I made these for our Sunday School class a couple of weeks ago, and they were devoured! They really do taste like blackberry pie. I will be making them again for a girl’s weekend away. Bring on the ice cream!! Thanks for the great recipe. I just made these today and the only thing I changed was I made them in an 8×8 pan and halved the recipe. They were delicious!! I think when I make them again I might add a little more flour to the dough if I am going to half them because I still had to use 1 egg and it made them a little wetter. These look delicious! One question, I don’t have a food processor or a powerful blender. Should I just cut in the butter and then add the egg and vanilla or should I just put it all in a bowl and cut on the butter with it? Yep – you can do it by hand! Just prepare for it to take a while. It’s a lot like making regular pie crust – just not as moist. Pingback: The Novice Chef » Top 10 Recipes of 2013! Awesome! I brought this bars to work – my colleagues were so delighted! I love the lemon zest in the dough, great idea. 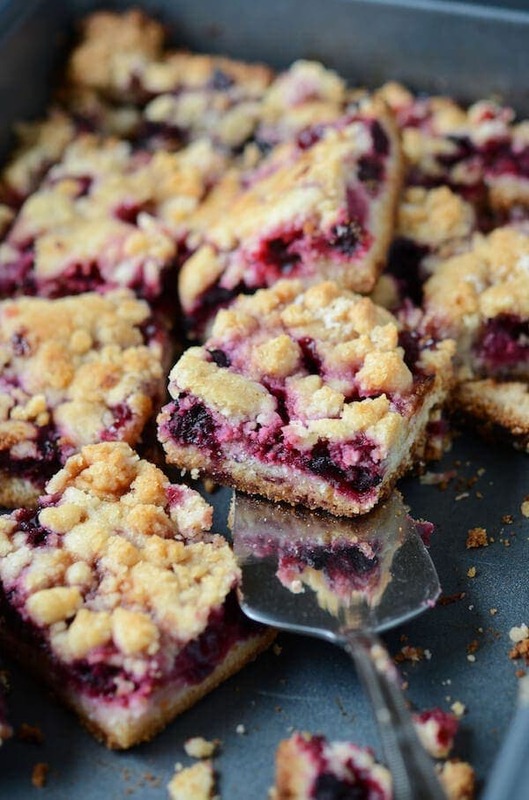 Pingback: Blackberry Pie Bars | The Grateful Girl Cooks! I found this on Pinterest and made it last week. It was fantastic! Thanks for the recipe. surprised my mom with a batch of these when she got home from work. she loved them and so did I!! Best with fresh picked blackberries! The best kind of surprise! Thanks for taking the time to come back and comment! Just made these and were delicious! I decided to glaze half of them with a thin orange juice and icing sugar mix. It just takes the edge of the sharpness for those with a slightly sweeter tooth. Thanks for posting! Hi Gabe, if you needed, you can add a little extra flour. But while it will be a little sticky, it should be able to turn into a crumbly top. Hope they baked up perfectly and you enjoyed them! Would it work to add some oatmeal for the top crust if itss too wet? Has anyone tried to make these using blueberries? Made for superbowl dessert.. served warm with vanilla ice cream. Crowd was very happy! Thanks for sharing the recipe! These were delicious pie bars. I didn’t have enough blackberries so I combined 2 cups of blackberries with 1 cup of raspberries and 1 cup of blueberries. Turned out wonderfully. Thank you so much! I just made these and they are soo good! The lemon is such a perfect tangy touch, and the berries just burst with deliciousness. I halved the recipe to make a smaller pan. I found that I only needed 30-35 minutes cooking time, and I covered mine with foil half way through to keep the topping from burning. Anybody have any ideas as to how to store/freeze them? So glad you enjoyed them! Thanks for taking the time to come back and comment on them! To store them, I leave them in an airtight container at room temperature for up to 3 days. I have not tried freezing them yet. If you do, please share how it turns out! I just made this with a mix of frozen blackberries, raspberries, and blueberries. I was a little concerned that they might be too wet, so I made just a little more dough to put on top. I don’t think they even needed the extra dough, they were delicious just as they were. I’d definitely make these again. Thanks for a great recipe! I doubled the recipe and it made 3-8×8 pans. Substituted gluten flour and added approx a half cup of extra sugar per batch to the berries. I sprinkled a little brown sugar on top as well before placing in the oven. I might consider adding an extra yolk next time. It was great and will make again. Made these yesterday – so delicious and tangy, wow. Blackberry and lemon make such a good combo. Thanks for sharing! How much lemon juice is used and how much lemon zest? Recipe doesn’t say. thanks. Hi Tim, yes it is the juice and zest of one lemon. Hi. Our friend brought over a tray full of black berries. searched the internet for recipes. ’bout died when I saw 40+ recipes available online. i thought, no way am i going to peruse let alone find one and the time to bake. luckily came across your website and decided to try your bar recipe. well… the house smells amazing. the recipe was very easy and came together in no time. i substituted vanilla extract for almond because i ran out of the vanilla. looks amazing and I can’t wait to cut into it. Thank you! !